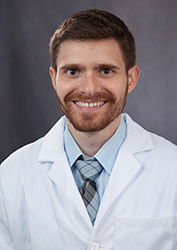 Second-Year Radiology Resident Austin Faulkner, MD, is the recipient of the Memorial Award from the Association of University Radiologists. In honor of deceased members of the Association of University Radiologists (AUR), a Memorial Award may be presented annually to a radiology medical student, resident or first-year fellow who submits an outstanding original paper on any aspect of radiology. Dr. Faulkner's paper, "Simulation-Based Educational Curriculum for Fluoroscopically Guided Lumbar Puncture Improves Operator Confidence and Reduces Patient Dose" published in Academic Radiology, and he received an honorarium, crystal award and certificate. He also presented his essay during the AUR 63rd Annual Meeting in New Orleans, Louisiana in April.